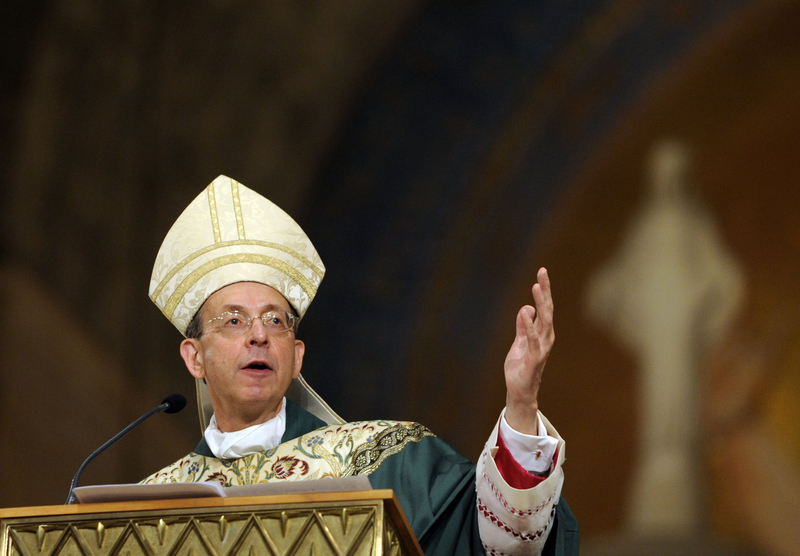 WASHINGTON (CNS) — At what is a critical time for American Catholics to stand up in defense of life and religious freedom, they must engage in the church’s new evangelization effort, deepening their faith and sharing it in their everyday lives and in the public square, Baltimore Archbishop William E. Lori said Oct. 14. He made the comments in the homily at a Mass and Pilgrimage for Life and Liberty at the Basilica of the National Shrine of the Immaculate Conception in Washington. “If we want to turn back the powerful incursions of secularism against the dignity of human life and the freedom to practice our faith, then we must heed the call of Pope Benedict XVI to engage in the new evangelization, to stand with Christ, to know our faith, to love our faith, (and) to share our faith,” he said. Archbishop Lori, chairman of the U.S. bishops’ Ad Hoc Committee for Religious Liberty, was the main celebrant at the Mass, which drew a standing room crowd of an estimated 5,500 to 6,000 people. 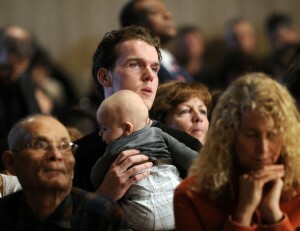 Archbishop Carlo Maria Vigano, apostolic nuncio to the United States, was in attendance. 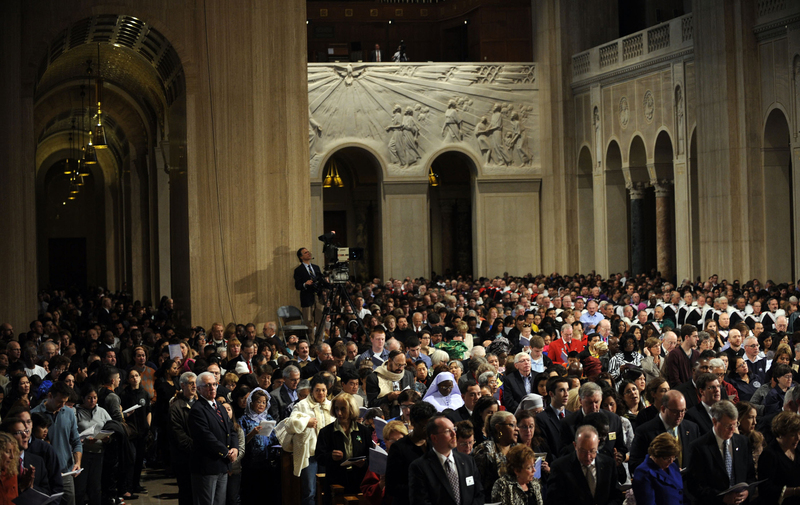 The Mass and pilgrimage are part of the U.S. bishops’ annual Respect Life prayer campaign; each year October is designated as Respect Life Month by the U.S. Catholic Church. The liturgy concluded with eucharistic adoration and the launch of an Oct. 14-22 Rosary Novena for Life and Liberty. “This afternoon, we speak with one voice as we raise our voices in supplication to God for the protection of our first and most cherished freedom, religious liberty and for the protection of all life, from conception to natural death,” Msgr. Walter R. Rossi, shrine rector, told the congregation. The overflow crowd filling the national shrine included families with babies in strollers, and senior citizens and people with disabilities in wheelchairs. People came from not only the Washington area but many other states as well. The opening procession included a Knights of Columbus color guard of 120 men wearing white, gold, green, purple and blue plumed hats. During the eucharistic adoration and rosary novena, the diverse congregation crowding the pews and aisles knelt and prayed together for life and liberty. Archbishop Lori pointed out how, in the nearly 40 years since the U.S. Supreme Court legalized abortion on demand in its Roe v. Wade decision, more than 50 million unborn children have lost their lives through abortion. The secularist assault on life, he said, can also be seen in efforts in the United States to legalize assisted suicide and to redefine marriage. A narrow religious exemption applies only to those religious employers who seek to inculcate their religion and who primarily employ and serve people of their own faith. The mandate is currently being challenged in courts around the country by Catholic dioceses and agencies and other religious individuals and groups. 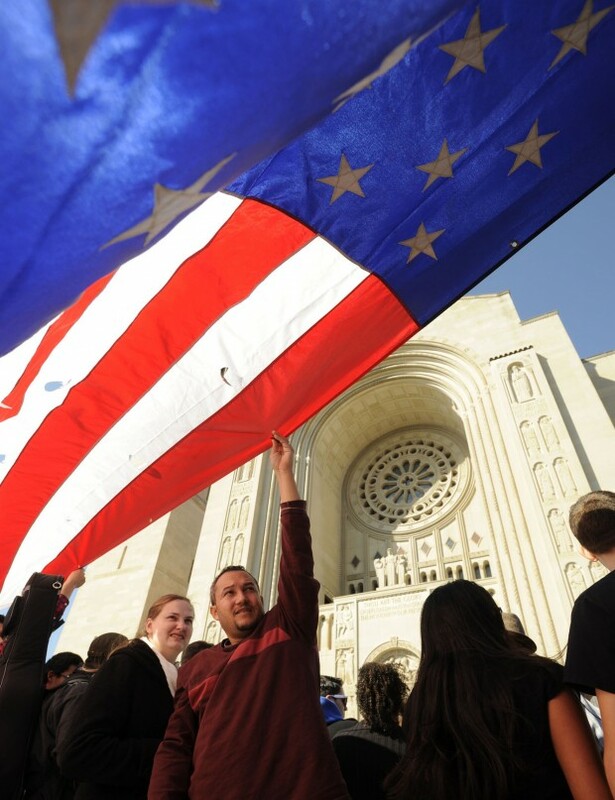 As the Year of Faith opens and as the country approaches a time of decision with its elections, Archbishop Lori called it a critical time for Catholics to engage in Pope Benedict’s call to the new evangelization. 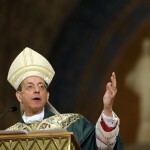 Archbishop Lori urged Catholics to take their faith to the public square and to the voting booth. “As believers and as citizens, we must robustly engage in the political process by voting with a properly formed conscience and by continually letting our elected officials know that we expect them to protect the God-given rights of life and liberty,” he said.